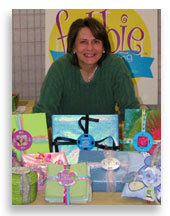 Fobbie Gift Wrapping: Gift Wrapping a Fishing or Tool box for Christmas is easier than you think! 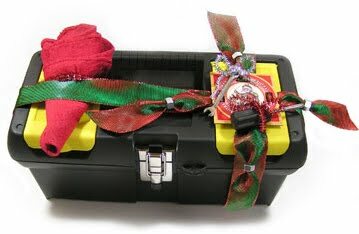 Gift Wrapping a Fishing or Tool box for Christmas is easier than you think! I can't help but look at an item and think how I could creatively wrap it with a Fobbie. I love being able to purchase gifts for friends and family that relate to their interests. A friend of mine never seems to have any tools when she needs one and is always borrowing something from me. Being a woodworker and antique fanatic I collect all kinds of tools, old and new. I decorate my cabin with what I call "studies." I have several areas on the walls of my cabin that showcase nothing but antique tools such as wrenches, levels, rakes and saws. They are so unique and interesting to look at. I figured for Christmas I would get my friend a toolbox and fill it with the essential new tools we use most often. I got a screwdriver and wrench set, some shop rags, various sizes of nuts and washers, a claw hammer, and of course duct tape. To gift wrap it, I used a vintage holiday designed Fobbie and ribbon, but to give it more flair I threaded small nuts on to the ribbon to add interest. I also echoed what was inside by attaching a small wrench, screwdriver and shop rag with decorative holiday wire. Additionally if you where going to give other tools like a belt sander, a drill or some type of saw that comes in those nice plastic cases, you could easily Fobbie wrap it. Again, you could attach accent items like a flexible measuring tape—I would get one from the sewing department, and use that as an accent on top of the ribbon. I have also taken long strips of duct tape and folded it in half and used it in place of ribbon. If you used one of our D0-it-Yourself Fobbies, you could color, collage, decorate or leave it white and then attach a retractable measuring tape to the top or perhaps a small box of nails, nuts or drill bits. Anything that will attach on top will work. Perhaps you have a fishing enthusiast in your life. I think you could easily do the same idea with a fishing tackle box. They are about the same size and have a of variety styles. Filling it with fishing tackle would be fun. Fishing hooks, line, bobbers, reels, spinners, etc. There are so many colorful lures you could use to hang on the outside of the box. Perhaps a colorful stringer could be threaded through as an accent on top of the ribbon. Some wooden carved fish hanging like a "catch" could be fun. Maybe you have a picture of a "big fish catch." You could put that in a picture frame Fobbie, that way when it came off the package they could keep it and make it into an ornament to hang, or attach a magnet on the back and put it on the fridge. I can't tell you how many hours I spend walking through various departments in stores and do nothing but think about all the creative ways everything I'm looking at could be turned into creative wrapping. The possibilities are endless!